This unique book fully chronicles The Shadow's career in films and television. 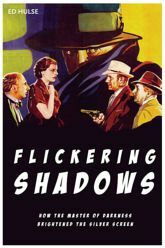 Beginning with the character's 1931 motion-picture debut in Universal's "Shadow Detective" featurettes, Ed Hulse follows the premier pulp hero in his two Grand National feature films, his 1940 cliffhanger serial, his three Monogram "B" mysteries, his two unsold TV pilots of the '50s, and the big-budget 1994 spectacular starring Alec Baldwin. Along the way, Hulse debunks Shadow movie myths -- and even covers films scripted but never made -- drawing on his extensive research and in-person interviews. He also discusses the Shadow pulp magazine to provide context for his examination of the motion pictures. The book is illustrated with stills, posters, lobby cards, vintage pulp covers, and even frame captures from the films themselves. A must-have for Shadow fans! 98 Pages. Trade Paperback. 7" x 10"